Cardiff Blues signed off from the Heineken Champions Cup in style as they ran riot against Lyon at the Arms Park. Wales' Capital Region trailed by two points at half-time despite an impressive brace from Aled Summerhill, who took his European tally to four. And it was one-way traffic in a dominant second-half with Owen Lane, Tomos Williams and Lewis Jones, making his 100th appearance all scoring. It could have been more but the Blues will be satisfied with the bonus-point triumph, their fourth in a row against Lyon, which brings an end to their first Champions Cup campaign since 2013/14, with two group stage wins. Attention now turns to the Guinness PRO14, as John Mulvihill's side look to secure their place in European rugby's top table for a second consecutive season, starting with next week's home clash against Connacht. 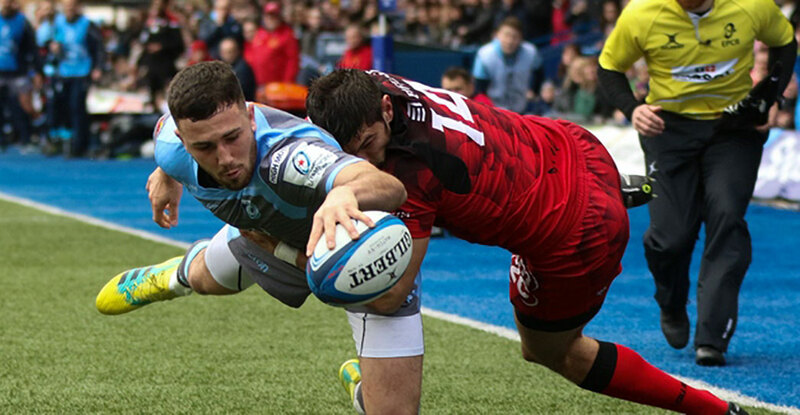 The encounter got off to a flying start at Cardiff Arms Park with both teams displaying their attacking intent. Lyon were getting the better of the affairs in the opening exchanges and a superb offload from Jean-Marchellin Buttin unlocked the Blues defence. Alexis Palisson kicked ahead but Harri Millard won the race to touch down in goal and concede a five metre scrum. From there Lyon set up camp with their dominant scrum earning a free-kick and then penalty advantage. The French outfit went wide where they were held at bay by the Blues' committed defence but after returning for another scrum they powered over for a penalty try. It did not take Cardiff Blues long to respond and it was Millard that laid the platform with a razor-sharp break that cut Lyon in half. The ball was recycled and went through the hands of Nick Williams and Jarrod Evans to send Summerhill over with a dummy. Anscombe converted from wide to level the scores and the Blues took the lead on the half-hour mark with Millard again making the vital line-break after hitting a short ball from Evans. He beat one defender but could not quite round the full-back and the ball was recycled. With Lyon's defence disorganised, Evans embarked on an arching run to the corner where he put Summerhill away for his second. Anscombe was unable to add the touchline conversion and the Blues were dealt a blow as Lyon claimed a try of their own shortly before the break. A poor clearance afforded the French outfit the opportunity and they took it with both hands as Toby Arnold went on the counter and released Xavier Mignot with a fine offload out of the tackle. Buttin slotted the conversion to give the visitors a slender lead following an entertaining and open first half. It took Wales' Capital Region less than five minutes to claim the opening try of the second-half and it was a stunning effort from Lane. After Josh Navidi pounced on loose ball, possession was moved to Tomos Williams. The electric scrum-half toyed with the ball in one, out-stretched hand as he went between two defenders and flicked an offload to Lane. The powerful wing had Arnold to beat and he did so in style, fainting inside before backing his pace as he eased around the full-back for a sensational try. John Mulvihill's men continued to threaten and ten minutes later, Williams went from provider to scorer as Navidi popped the ball up from the floor to the scrum-half, running a trademark support line to dive over. Anscombe was once again on target and the floodgates were now open with replacement scrum-half claiming his side's fifth try minutes after coming on for his 100th appearance for the region. The try was scored in bizarre circumstances but that would not have bothered Jones one iota as he deservedly hit his personal milestone after becoming the youngest Cardiff Blues player to reach 50. An Anscombe chip unlocked the Lyon defence and slick hands released Summerhill, who raced down the left before passing inside. The pass flung two metres forward but Jones reacted quickest following the encouragement of Summerhill and replays proved a Lyon hand had deflected the ball. Wales fly-half converted once more, and despite Lyon's best attempts in the final stages, the French outfit failed to break through for a second half score thank to a stern defensive effort.